Which makes it the perfect time to declutter ALL that old, outgrown summer stuff you NEVER ever use that’s clogging up your garage, your attic and every cupboard in the house. Firstly, because it will make YOU feel better. And give you MORE space to enjoy the sunshine. BUT secondly because there’s heaps of people out there ready to take it off your hands! What’s your local store stocking right now in amongst all the other stuff you actually need? Gardening stuff. Picnic stuff. BBQ stuff. Outdoor games. Right? Basically everything that says sunshine. And the beach stuff will be hot on its heels. NOW you DO NOT want to buy this stuff do you? Because the last thing you want is more clutter. 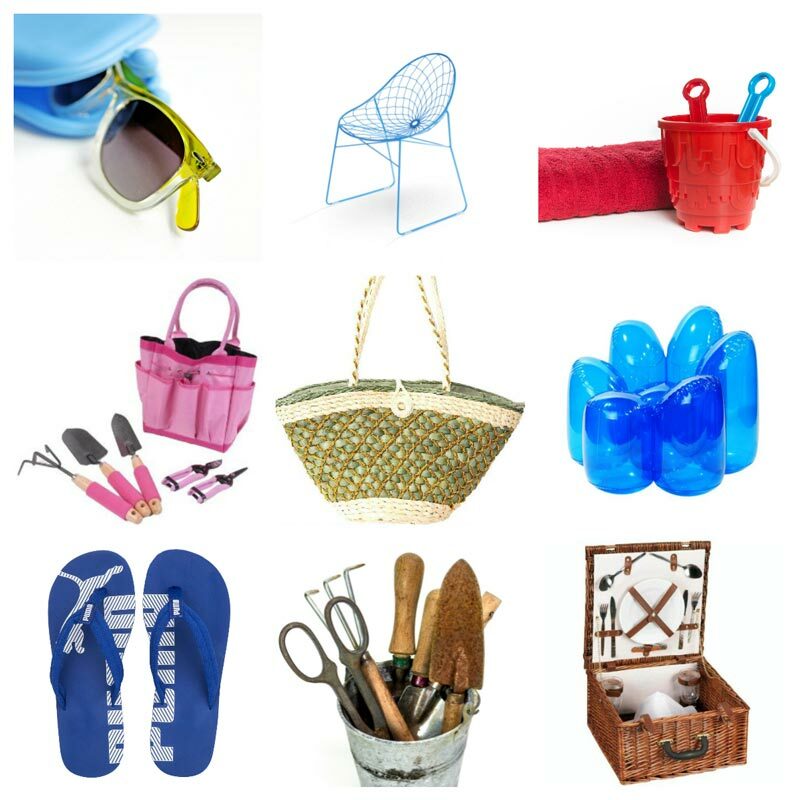 BUT it shows us, right now is the perfect time for you to pass on your summer clutter. So it get reused – big hurrah for the planet! – AND you get some money. I’ve got a big list for you below of stuff to declutter RIGHT NOW. But before that some tips on how to declutter. AND how to sell your clutter or just pass it on easily, so it’s out of your hair! For ongoing help and tips do sign up for my FREE declutter support mails. OK. So, the best way to win the clutter war is little by little. I use the daily just 10 things method. Which turns decluttering into a powerful habit in just a few minutes everyday. You could use this method to work through the list below. Nice and calmly and methodically. BUT if your home’s anything like mine all that summer stuff is in an unbelievably enormous jumble in your garage or shed or basement or kids rooms! If that’s the case, start off with a few 15 minute power purges. These will get lots of surface junk in the bin and recycling. AND help you spot where the summer stuff is hiding. You can then work through it little by little in a few minutes everyday in the order you can get to it without pulling everything else down on your head!! Just please REMEMBER the golden rule of just 10 things and the power purge is that you DO NOT yank loads of stuff out and spread it out all over your home or garden. Just extract a little everyday and let it go. And here’s how to let it go. MOST of us do NOT have hidden treasure hiding behind a long forgotten sun lounger. So most of will not make any kind of fortune selling our clutter. But we do have plenty of summer stuff other people will happily cough up 10 to 20 quid for. (That’s 10 to 20 dollars give or take a cent or two for you Americans). Now obviously, we could put this stuff on eBay or Craigslist. AND it gets in people’s face – when the sun’s shining – and says come buy me now! 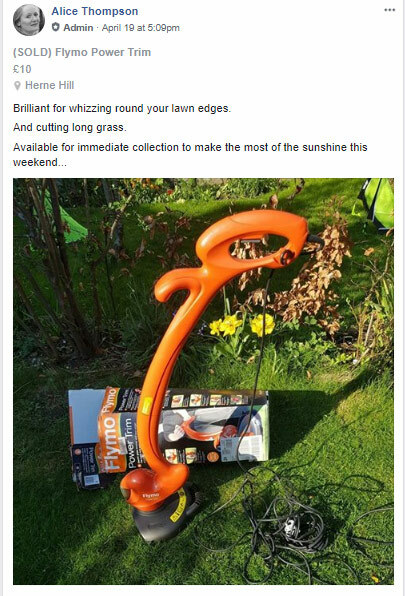 I’ve been selling stuff like this not-used-for-seven-years strimmer on Facebook. It’s been 5 or 10 minutes effort top. And gone from our shed in days. Hurrah! If you’ve not sold on Facebook before check out my tips here. NOW not everything will sell. BUT you can also freecycle big, old, battered stuff on Facebook. So you don’t have to take time to lug it to the tip or recycling centre. And that in itself is a win isn’t it? Right we’ve covered the how to declutter and how to sell clutter. BUT don’t angst over stuff you’re NOT ready to let go. OR other family members aren’t. Wow! It’s a monster list isn’t it? BUT we do all have so much crammed in our homes we do not have the time and space to enjoy. And that someone else can enjoy more. You won’t have all of these or want to get rid of all of them. But letting go just 5 or 10 of these will reclaim YOUR living space for YOU! What the heck is Swedish death cleaning?